VMAP, in association with the Institute of Archaeology (Vietnam) and Flinders University, will conduct a two week terrestrial and maritime-based maritime archaeology field school in Jan/Feb 2018. Fieldwork will take place in the World Heritage Areas at Hue and Hoi An and the Marine Protected Area at Cu Lao Cham and will include a visit to the World Heritage Area at My Son. 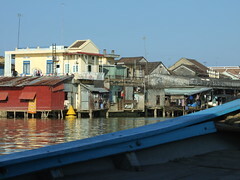 Accommodation will be at the Bach Dang Hotel in Hoi An. Sat 26 / Sun 27 January to Sat 10 / Sun 11 Feb 2018. Dates are fixed. – Side-scan sonar, magnetometer and ROV training and use at Cu Lao Cham. – 3D modeling, drawing, photography and cataloguing of the Dutch shipwreck cannons located in Hue. – 3D modeling, drawing, photography and cataloguing of traditional style Bau boats built by the master boat builders of Kim Bong village near Hoi An. SCUBA diving certification is not required. All participants will be expected to arrange and pay for their visa for Vietnam as well as travel insurance and their own airfares to and from Da Nang in Vietnam (Approximate cost AUD$800). Participant Fee: US$1,000, AUD$ 1,200 or 800 Euros. This fee will be used to cover on-the-ground expenses such as ground transportation, food and accommodation as well as making a contribution towards the fieldwork costs. Hoi An’s ancient wells will be restored, according to a new plan to revitalise the water system. The historic central city of Hoi An plans to restore 80 ancient wells, most of them locate on the north bank of the De Vong River near the Thanh Ha pottery village. Built in the 15th century by the Cham people, most of the city’s ancient wells are unusable or buried underground due to rapid urbanisation, said Nguyen Chi Trung, director of Hoi An’s Centre for Monuments Management and Preservation. Trung said the plan would render usable several wells near the old town, including those at Kazik Park, the house of the Nguyen Tuong royal family at 658 Hai Ba Trung Street, and Am Hon Temple (built to worship the souls of the dead). A museum centred on trade activities in the 17th and 18th centuries will be built in the historical city of Hoi An. There doesn’tÂ seem to be any indication on the date of completion though. A number of archaeological sites, including the My Son Sanctuary, the ancient capital of Hue, Hoi An Ancient Town and the Thang Long Citadel have been named in a list of special national treasures in Vietnam. The Culture, Sports and Tourism Minister of Vietnam has highlighted the need for new legislation to meet the demands of heritage conservation work, especially in the light that many conservation projects do not meet quality standards and have even led to the damaging of some of the relics.